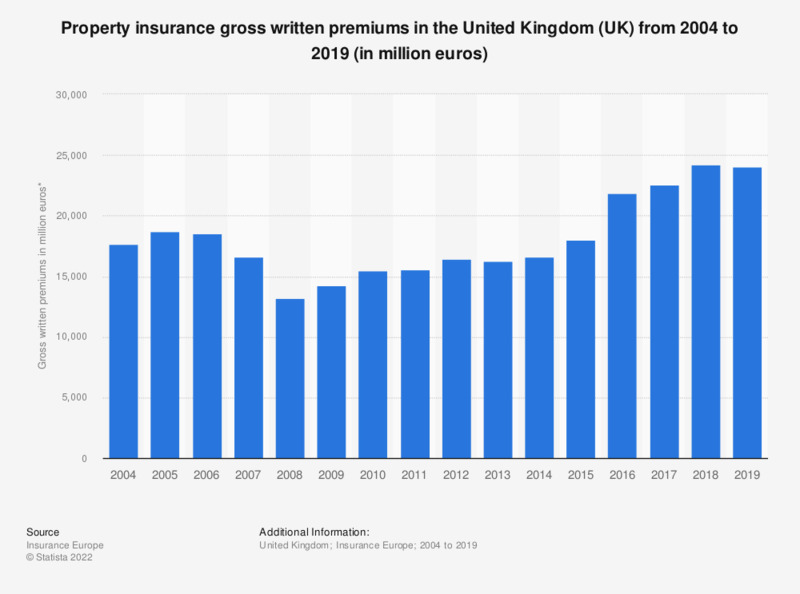 This statistic shows the total annual amount of property insurance gross written premiums in the United Kingdom (UK) from 2004 to 2016. The peak during this period came in 2016, when gross written premiums were at approximately 22.8 billion euros. * Data in constant exchange rate. Gross written premiums: Gross premiums written comprise all amounts due during the financial year in respect of insurance contracts regardless of the fact that such amounts may relate in whole or in part to a later financial year, and shall include inter alia: (i) premiums yet to be written, where the premium calculation can be done only at the end of the year; (ii) single premiums; (iii) additional premiums in the case of half-yearly, quarterly or monthly payments and additional payments from policyholders for expenses borne by the insurance undertaking; (iv) in the case of co-insurance, the undertaking's portion of total premiums. The above amounts shall not include the amounts of taxes or charges levied with premiums (from Article 35 of Directive EC 91/674/EEC). Accepted reinsurance is excluded (ie corresponds to direct business).